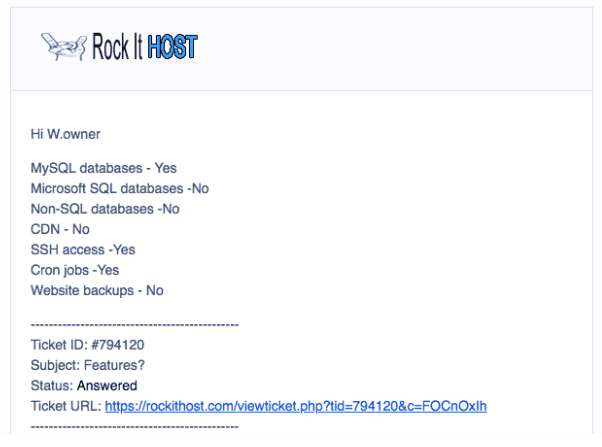 Rock It Host Review 2019: Is Rock It Host a Good Hosting? Rock It Host is a U.S.-based hosting provider with a simple selection of shared hosting plans. There’s limited information about the company, but the plans are solid with a good level of resources and features. Rock It Host does not include much information about the business itself on the website, nor does it have a Facebook or social media channel. As far as I can make out from the Terms and Conditions, it’s a California, U.S.-based business. The website and service is available in English only. It’s quite apparent — and one of the company’s strongest traits — that its packages are packed with resources. For example, you get unlimited email accounts, unlimited databases, unlimited FTP accounts, unlimited add-on domains, unlimited subdomains, and unlimited parked domains. Although disk space and bandwidth are not unlimited, the allocations are high. Bear in mind, however, that if you exceed these rather generous allowances, Rock It Host does charge overuse fees. To help you get your website started, there’s a one-click installer with more than 400 programs. All the popular programs such as WordPress, Drupal, and Joomla! are supported. Further, there are free website building tools included in the plans. More advanced users will be happy to hear that there are MySQL databases, SSH access, and cron jobs, although there’s no CDN and — take note — no website backups. The servers run on SSD instead of HDD, which means disk read / write speeds up to ten times faster. They also use cPanel, which is an easy-to-use and popular control panel in the industry. One thing you’ll have to watch out for though: on the product pages, Rock It Host lists a 99.99% uptime guarantee, while its terms state a 99% commitment. I’d go with the latter to be on the safe side, but at least you do get pro-rated credits in the event of excessive downtime. Given the high level of resources, the plans are reasonably priced. Unlike a lot of companies, the plans also include a free domain (annual plans only) and SSL certificate, so the packages are almost an all-in-one solution. Plans can be purchased on 1, 3, 6, and 12-month terms, with a discount (and free domain) applied for the annual plan only. There’s also a 30-day money back guarantee. Customer service is only available from 9.00 AM to 5.00 PM via ticket, which is limited and would concern me in the event of an issue on my website. There’s a live chat link on the website, though it would not open for me (it was before 9.00 AM when I tried), and there’s no knowledge base to refer to either. That said, I submitted a ticket early in the morning on a weekday and received a response within two hours answering my questions in full. On paper, Rock It Host sounds great. My only reservation is the lack of information about the business itself and the limited technical specifications on the website. Nevertheless, the 30-day money back guarantee offers you a way to try out the company with minimal risk. Wondering how Rock It Host stacks up against other Web Hosting companies? Enter any other Web Hosting company and we will give you a side-by-side comparison.